With a population of 1.23 million, Marseille proudly calls itself France's second city. The past stigma concerning crime and racial tensions has finally been laid to rest as the city opens itself up for investment and connects itself to Paris via the high speed rail link. Both Parisians seeking a break in the south and businesses looking for somewhere to settle are coming to see Marseille as a considerably branché (well connected) place. Greek settlers founded the city around 600 BC and it quickly became a centre of commerce and industry for the region. This period of prosperity was nearly brought to an abrupt end when Marseille decided to support the Roman general Pompey over Caesar. When Caesar emerged as the victor he set about punishing those who abandoned him. 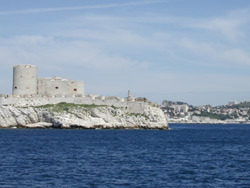 Marseille was stripped of many of its possessions. Fortunately for Marseille, crusaders in the 11th Century decided to use it as the main port for transport to the Holy Land. As a result the city had a spectacular turn around and reclaimed its affluent status. Marseille certainly had its part to play in the revolution, hundreds of volunteers set off from here in 1792 on their way to Paris. The 'song of Marseille' was sung to rouse the soldiers along the way. The other revolutionaries caught on and began singing it themselves. Today it is the French national anthem. The city has long been a beacon of hope for refugees and other migrants. It was the main port by which Corsicans, Armenians, Jews, Algerians, Spaniards, Italians, Greeks and Turks entered Europe. A great number of these decided to settle in Marseille itself creating what is today a highly diverse and cosmopolitan mix of cultures and nationalities. Marseille's Greco-Roman history has certainly left a mark on its culture. There are more theatres in Marseille per capita of the population than anywhere else in France. The town has an exuberant atmosphere with plenty of cafés, bars and restaurants. If you'd rather cook your own meal from the local delicacies then the fish market is where to go. Just make sure you set the alarm clock! British Airways will take you to Marseille from Heathrow. EasyJet will make the journey from Gatwick, Liverpool and Bristol, and Ryanair flies from Glasgow. Both the TGV and Rail Europe services will take you all the way to Marseille. Thanks to the council's regeneration efforts, property here has been given a head start. Marseille also has a very large buy to let market meaning that those wanting to gain money back from their property will have little difficulty. Do you know Marseille better than we do? 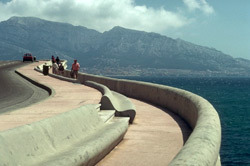 Do you have photos of Marseille? On the eastern edge of the Bouches du Rhone department's wide bay. Access: Has its own airport with regular flights to and from Heathrow, Gatwick, Liverpool, Bristol and Glasgow. Economy: The French government have put a lot of work into rejuvenating the town and, as a result, a whole range of businesses have been setting themselves up here in recent years. Interesting fact: The French National Anthem was originally the 'song of Marseille'.